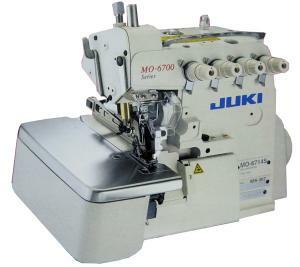 See Optional Juki MO6704-150 1.6mm Dedicated Rolled Hem Merrow Stitch Edge, Industrial Overlock 3-Thread Serger MO-6704-150, 4:1 Differential Feed, Power Stand 7000SPM, 100 Needles. This model available to be set up as exclusive and dedicated narrow rolled hem machine, Juki MO6704-150. seams that flexibly correspond to the elasticity of the material at the maximum sewing speed of 8,000 to 8,500sti/min. the needle thread heat remover and needle cooler. operating noise and vibration, which has been achieved by designing an optimally balanced machine. contributes to increased durability and reliability. cooling fan, thereby ensuring enhanced reliability. seam quality at higher sewing speeds. href="http://www.allbrands.com/info/storepolicies.php#freight"target="_blank"> Please review our Freight LTL Shipping Policies Ships Ground Freight only. Fully Assembled with Machine Installed in Submerged Table Power Stand, Ready to Sew.